It’s Halloween, the spookiest party of the year. For the day, your house should be ready to welcome scary ghosts, ghouls, and goblins. Frightening adornments and trick-or-treating are some of the important fun-filled activities that are enjoyed by families on October 31st. Leaving all things aside, what you’ll be going to serve to your unearthly friends on the All Hallows’ Eve? Obviously, the food must be stuffed with horror and creepiness. 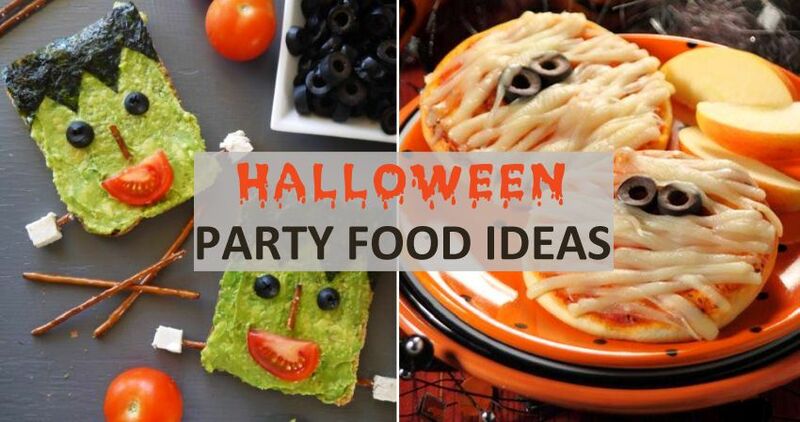 However, if you don’t have time to prepare a full course meal, then here are a few super easy Halloween party food ideas that you can whip up quickly at the last moment. It is a no-bake Halloween food recipe. 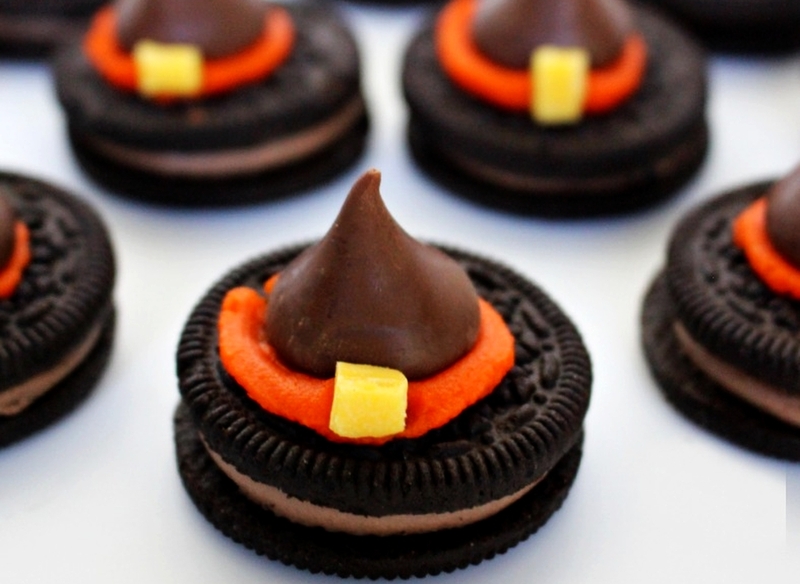 To make these witch-hat cookies all you need are four ingredients: chocolate creme Oreo cookies, Hershey’s Kisses, yellow candy melts and orange-colored frosting. You just need to decorate the cookies in a spooky way. These black cat cookies are easy to make and kids will love them. If you don’t have much time and aren’t into baking, it is the right recipe for you. 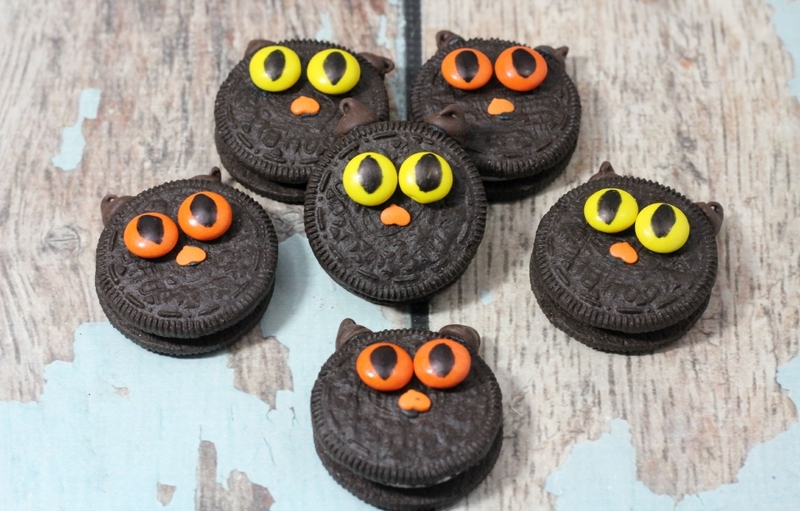 You just need a few Oreo cookies and colored frostings to turn them into black cat treats. It is surely a frightening yet fun food hack. Create a mummy-like appearance by wrapping white-colored tape or gauge bandage around a tetra-pack of juice or other food boxes. Add creepy googly eyes to intensify the effect. If you’re a good baker, you can easily create yummy cupcakes for your guests. 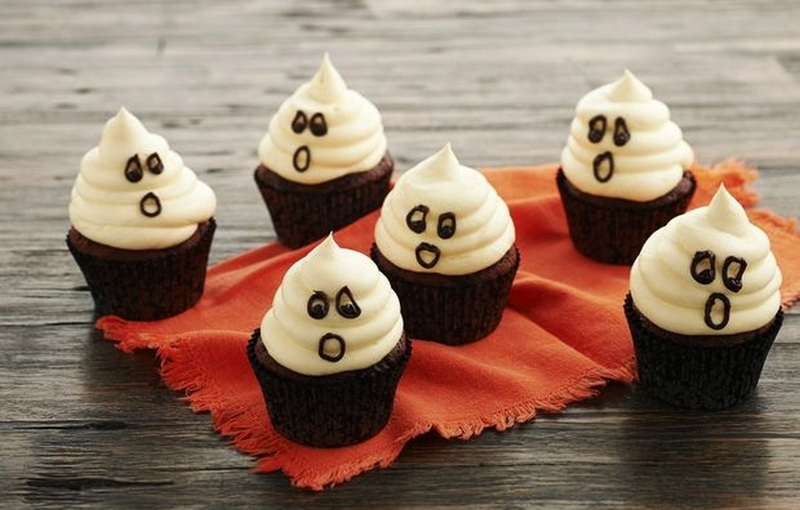 If you’re making this for Halloween, you can decorate the cookies with cream to add a ghostly charm. You can also draw faces on the cream you have layered on the cupcake. Want to impress your neighborhood kids. 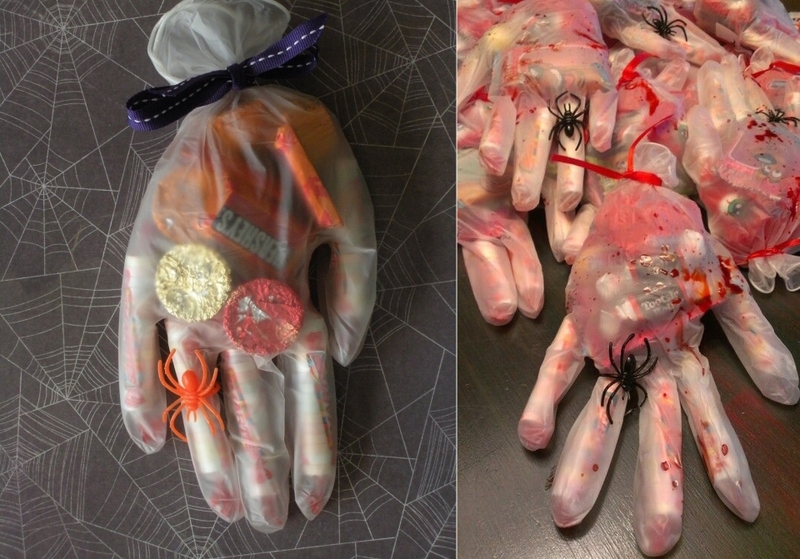 Serve them candies in blood-stained surgical gloves. It’ll surely give them heebie-jeebies. 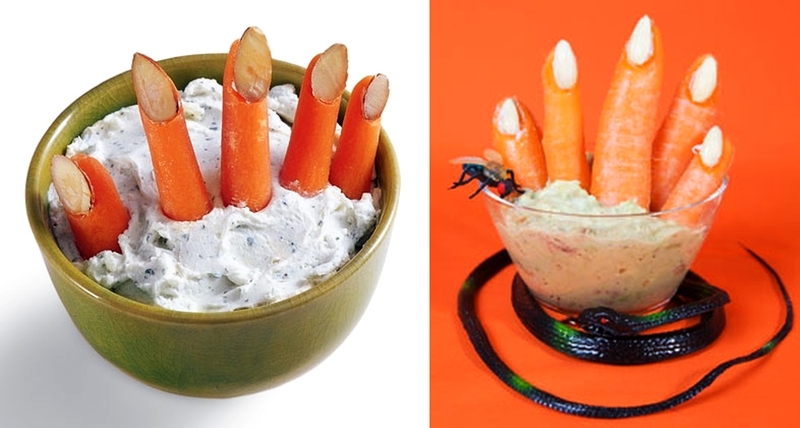 Using fresh carrots you can create evil witch hand and serve them to your health-conscious guests on the eve of Halloween. It’ll be a pleasant treat for vegetarians with a surprising frightening factor. You can prepare this creepy Halloween recipe in just 10 minutes, and it’ll surely be loved by your guests especially youngsters. Olives here act as spooky eyes and layers of cheese are the key to the ‘mummy-like’ apperance of the pizza. 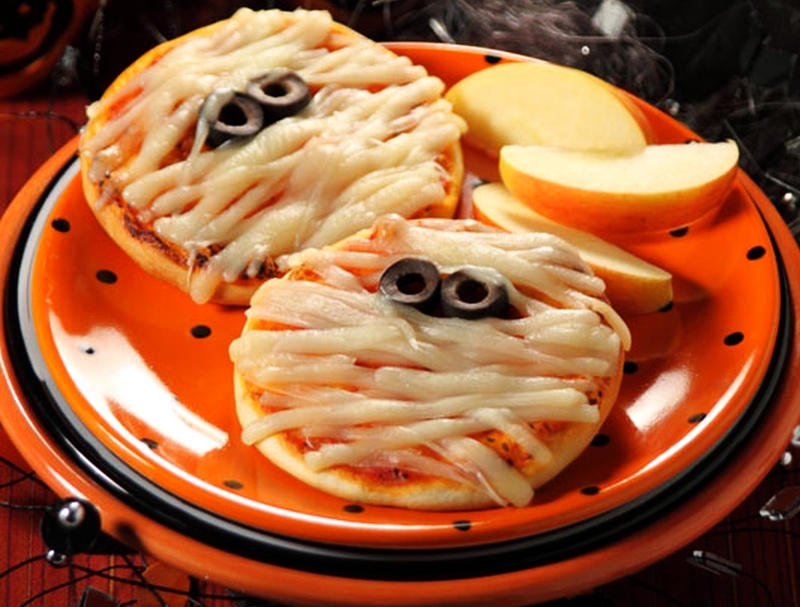 It is easy to make Halloween recipe that kids will love to eye at the dining table on Hallows Eve. Use avocado paste to make its face, dry toasted seaweed for hair, black olive for eyes and a sliced tomato as its mouth. Add fake plastic spiders in ice cube tray and freeze them until they are solid. 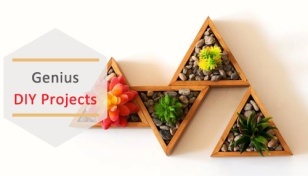 Add to any beverage and serve chilled to your guests. 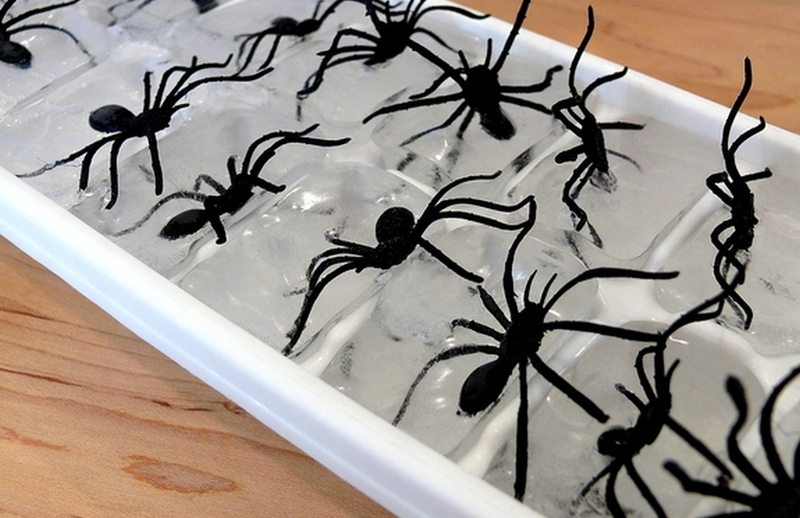 These spider ice cubes are sure to give shivers to your Halloween party guests, especially the ones who are arachnophobic. How can you forget Jack O’ Lanterns for Halloween? Try this recipe idea, where burger buns and meat patty topped with a cheese slice patterned like Jack O’ Lanterns is put together to enhance the scary factor of All Hallows’ Eve. 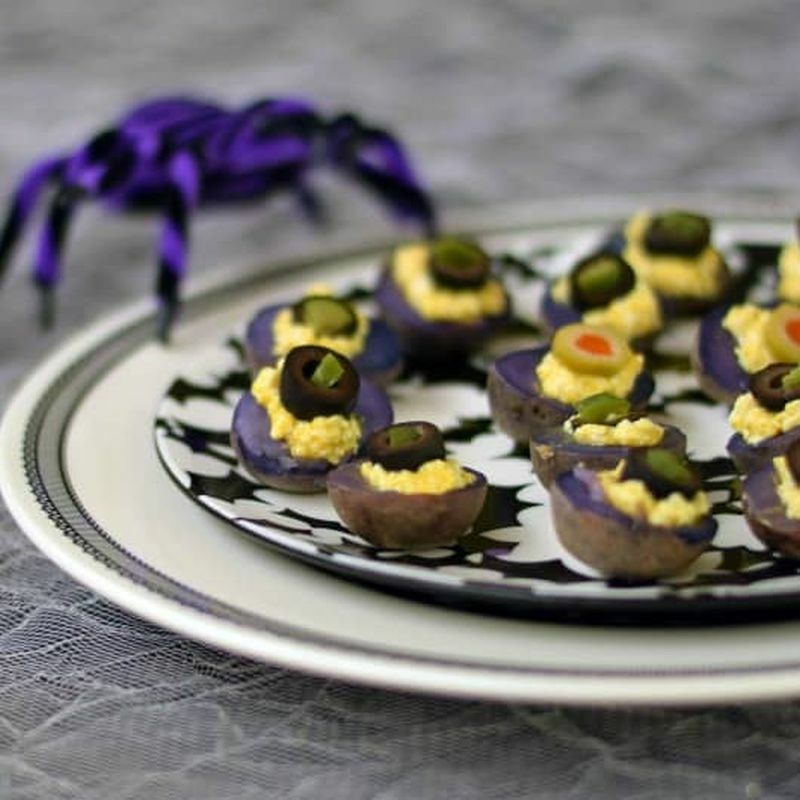 Spooky looking food items are the staple of any Halloween party. 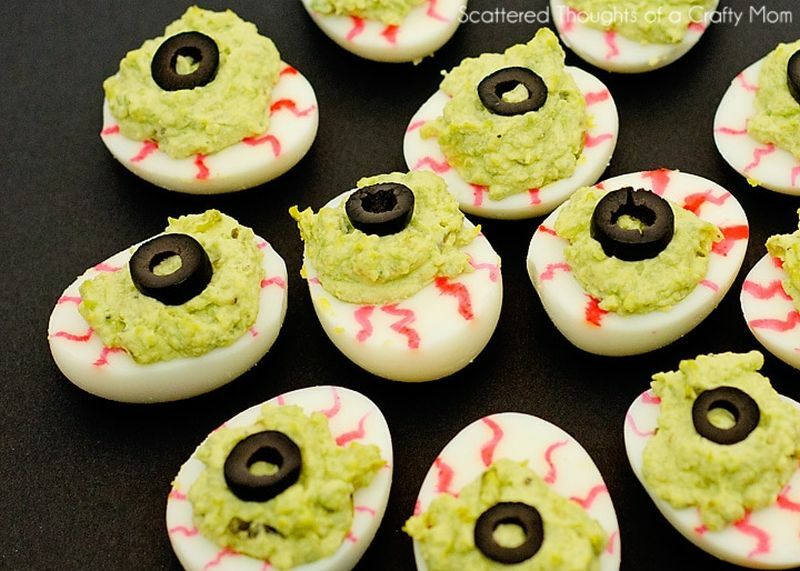 You’ll need boiled eggs, avocado, and black olives and other basic ingredients to prepare the monster eyeball recipe. Boil some potatoes until they are ripe and then cut them in half, lengthwise. 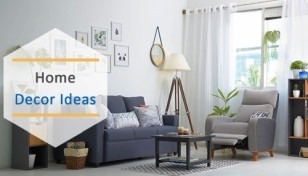 Decorate with tofu salad to give it a cool, creepy look, your guests and everyone at home will love it. 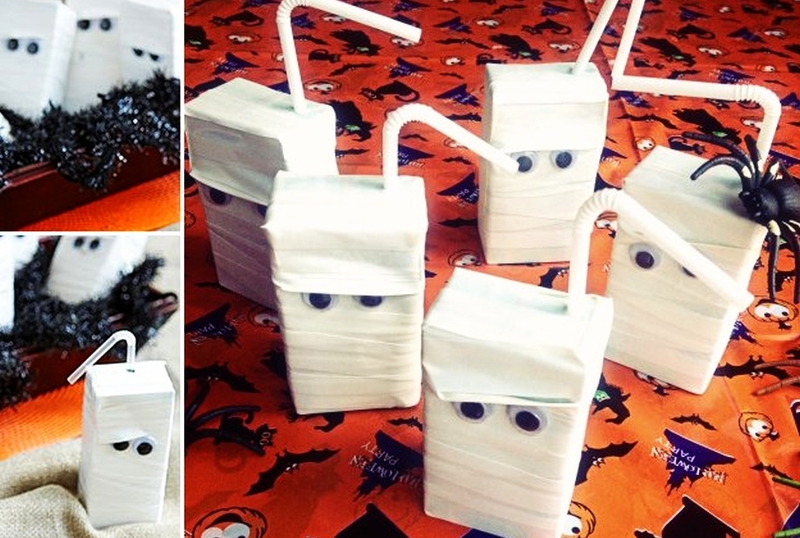 If you’re looking for fun Halloween recipes for the whole family, this one is right for you. Just cut the middle out of each quarter of the apple in order to create the shape of a mouth. Then fill the gap with almond butter. Use sunflower seeds as teeth and a sliced strawberry as the tongue. 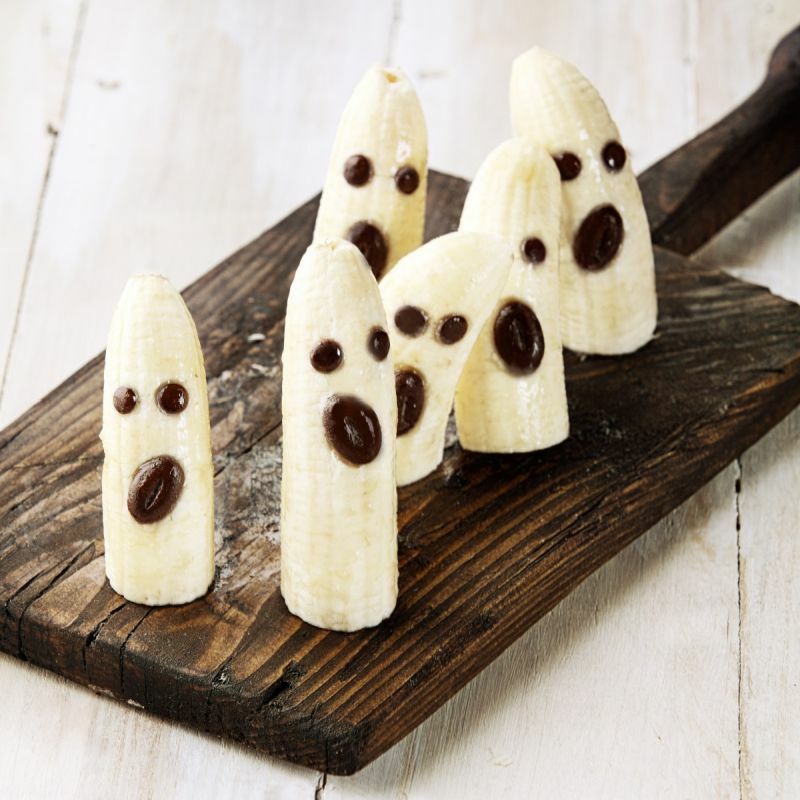 Take some bananas, cut them in half and decorate with chocolate chips to give them the appearance of a ghost. 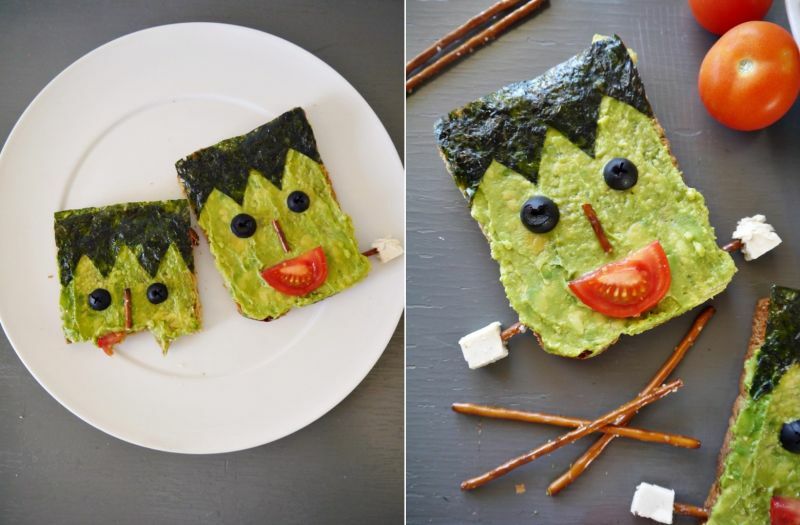 This easy Halloween food art can be prepared in less than five minutes. Even kids can make it in a jiffy. Get your guests into the spirit of Halloween with this spooky party punch made from lime and pineapple juice. 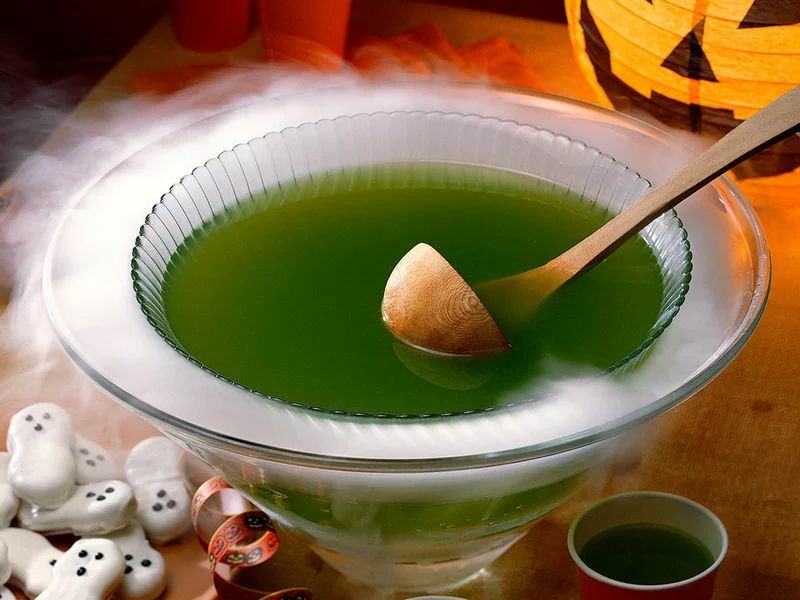 For a spooky effect, you can place the punch bowl inside a larger glass bowl filled with dry ice. 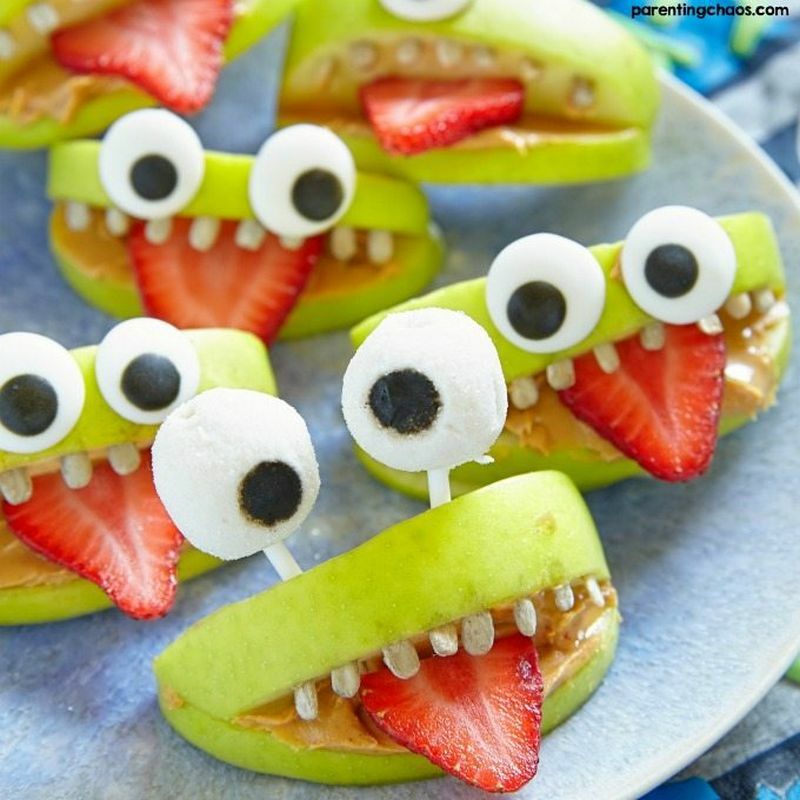 Hope you’ll have loads of fun while preparing these quick and easy Halloween foods. Happy Halloween!